White Nissan Micra, manufactured in 2012, first registered on 1 April 2012. Cylinder capacity: 1198cc, CO2 emissions: 115 g/km. As of 28 April 2018 this vehicle had done 96,687 miles. Current estimated odometer reading: 103,000 miles. 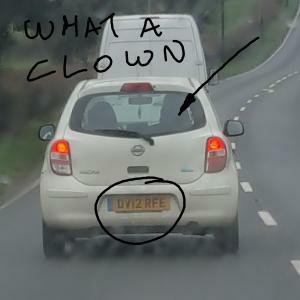 This CLOWN over took me behind that white van on a the straight A37 Fossway between Lydford on Fosse and Hornblotton. Only got back in by the skin of his teeth narrowly missing on coming traffic. I followed him for a further 12 miles and where did it get him. the moral of the story better to be 2 seconds late than be dead on time.